This story has been updated to include details from the arrest warrant affidavit. 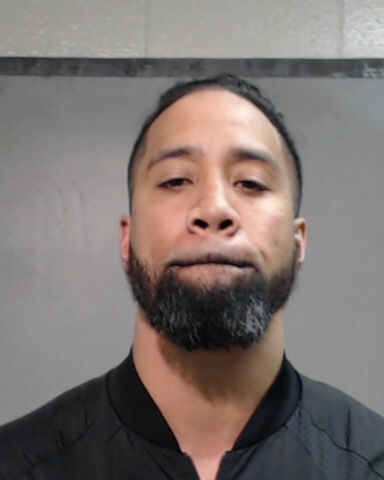 Pro wrestler Joshua Samuel Fatu, better known by his stage name Jey Uso, was arrested in McAllen over the weekend for driving while intoxicated. The Florida resident was in the Rio Grande Valley to compete in WWE live events held at Hidalgo’s State Farm Arena on Saturday and Sunday as part of a tag team with his brother, who performs as Jimmy Uso. Fatu, 32, was pulled over by a Texas Department of Public Safety trooper at approximately 2 a.m. Sunday after he failed to use his turn signal on North 10th Street, according to his arrest warrant affidavit. “Fatu appeared intoxicated and had a strong odor of an alcoholic beverage emitting from his breath,” the affidavit reads. He was booked into the Hidalgo County sheriff’s jail at 3:07 a.m. and released later that day at 2:41 p.m. on a $500 personal recognizance bond, according to jail records. On Saturday, the Usos retained the SmackDown tag team championships and the following night, hours after Fatu’s release from jail, the pair won another title match. Fatu regularly appears on the Tuesday SmackDown Live broadcasts. He is the son of WWE Hall of Famer Rikishi (real name Solofa Fatu Jr.) and an extended relative of Dwayne “The Rock” Johnson and current WWE wrestler Roman Reigns (real name Leati Anoa’i).